John West is an accomplished photographer with many years of experience and hundreds of publishable and historic photographs under his belt, 13 of which are available for purchase. His pictures bring narrow gauge enthusiasts immeasurable joy and pleasure. Originally Florence & Cripple Creek Railroad engine 3, the Denver & Rio Grande numbered it 424 before the Denver & Rio Grande Western numbered it 315. Durango Railroad Historical Society restored the engine from March 2001 until she moved under her own steam in August 2007. 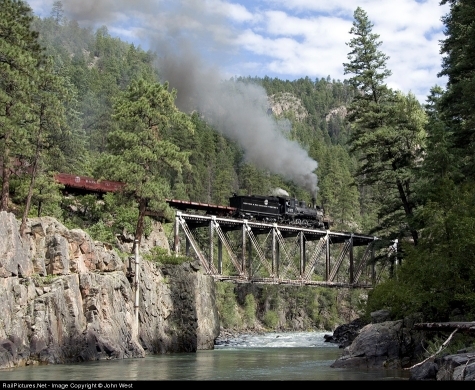 On August 23, 2010, during last year's Railfest, Mr. West captured #315, a former Denver & Rio Grande Western 2-8-0 steam locomotive as it crossed the Animas River near Tacoma, Colorado, on former Denver & Rio Grande Western rails, now operated by Durango & Silverton Narrow Gauge Railroad, which will host its 13th annual Railfest later this month. POTD - Has Anyone Seen My Right-of-way?